'We were somewhere around Barstow on the edge of the desert when the drugs began to take hold. I remember saying something like, `I feel a bit lightheaded; maybe you should drive ...`' Hunter S. Thompson is roaring down the desert highway to Las Vegas with his attorney, the Samoan, to find the dark side of the American Dream. Armed with a drug arsenal of stupendous proportions, the duo engage in a surreal succession of chemically enhanced confrontations with casino operators, police officers and assorted Middle Americans. This stylish reissue of Hunter S. Thompson's iconic masterpiece, a controversial bestseller when it appeared in 1971, features the brilliant Ralph Steadman illustrations of the original. It brings to a new generation the hallucinatory humour and nightmare terror of Hunter S. Thompson's musings on the collapse of the American Dream. Illustrations note w. ill. by Ralph Steadman. Hunter S. Thompson was born in Louisville, Kentucky in 1937 and died in Colorado in 2005. A full-time writer and journalist, he contributed regularly to a wide variety of publications, but is probably best known for his work as National Affairs correspondent for 'Rolling Stone', in which 'Fear and Loathing in Las Vegas' and 'Fear and Loathing: On the Campaign Trail '72' originally appeared. 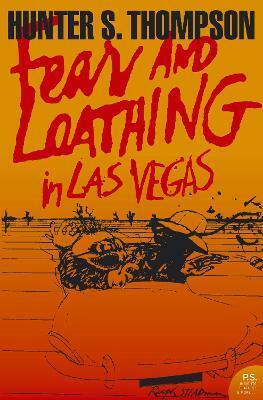 'Fear and Loathing in Las Vegas' has been made into a major film, directed by Terry Gilliam and starring Johnny Depp. Ralph Steadman is one of Britain's best-known cartoonists and illustrators. His books include 'I, Leonardo' and the bestselling illustrated 'Animal Farm'.